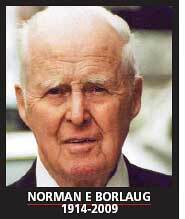 Norman E Borlaug, the agriculture scientist whose seminal contribution saved large parts of the world from hunger deaths, died of cancer at his home in Dallas, USA, on September 12, 2009. He was 95. He was working in the Texas A&M University almost till the end. He received the Nobel Peace Prize in 1970 for combating world hunger. Borlaug was a member of the team of scientists from Rockefeller Foundation asked to help Mexico overcome stagnating wheat yields. They started work in Mexico in 1944. Borlaug succeeded in creating wheat plants resistant to rust disease by crossing Mexican wheat with rust resistant varieties. This was the forerunner of Borlaug's main achievement--the stout dwarf wheat. At the time Borlaug and his Rockefeller team were at work, the impact of chemical fertilizers in increasing crop yields had been demonstrated. The logic of using chemical fertilizers was to supply nitrogen to soil to improve plant growth and yield. The fertilizers helped wheat crops but there was a problem--Mexicans had selected wheat varieties with long stalks that could outgrow weeds; with fertilizers they became taller and could not support the heavy grains at the top. The overweighed wheat plants keeled over. This ruined the crops. Borlaug found the solution. He crossed the Mexican wheat with a dwarf Japanese variety. The dwarf gene shrunk the wheat plant. What was more significant was that the ears of the seeds did not shrink; the shorter wheat plant produced large quantities of grain. Borlaug's work was a breakthrough. He had created a wheat variety that was resistant to rust disease and capable of producing ten times more grain than the Mexican varieties. Borlaug's dwarfing principle helped create high-yield dwarf rice in the Philippines that started the green revolution in south and south-east Asia. In 1963 the Rockefeller Foundation sent Borlaug to India and Pakistan that were facing famine. India's crop production broke all records in 1968. Borlaug's Nobel acceptance speech is relevant even now. He said food shortages can be prevented only by taming population growth.